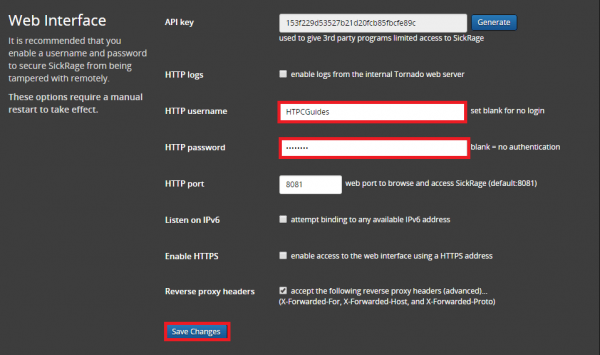 A reverse proxy is a secure method of remotely accessing services on your home media server. 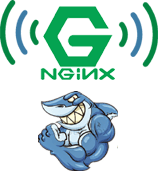 Using nginx on any Linux based system (Ubuntu, Debian, Raspbian) you can access SickRage without having to remember the port number inside your home network. With a free dynamic dns address (Linux, Raspbian) you can manage SickRage at your friend’s house at a custom address like htpcguides.crabdance.com/sickrage. It is very convenient and easy to set up once you know how, it will add that extra bit of awesomeness to your HTPC media server. This guide was tested on Raspbian but should work on any Linux based system. I assume you know what your IP address is and how to SSH in to your Linux box. Add these lines, adjust your dynamic dns address (mine is htpcguides.crabdance.com) and local IP address (mine is 192.168.40.105. If you changed your default SickRage port change 127.0.0.1:8081 to reflect your port. If you gave your webroot a different name in the SickRage config.ini file then it will have to match the location /sickrage line. You can now access SickRage locally within your home network at http://ip.address/sickrage. If you get a 502 Bad gateway error it may be because you are on a Raspberry Pi or slow machine, give it a few minutes to load the SickRage web interface. Enjoy your safe, secure nginx reverse proxy for SickRage. You can now close port 8081 on your router if you had it forwarded before. If you want reverse proxy brute force protection using fail2ban see this guide.